Every time my husband hits a home run one of us collects the ball and gives it to him. He writes the date, team, and field at which the home run was hit (and occasionally the score). He then takes the ball home and adds it to a box which houses the rest of the collection. With our 10 year anniversary rapidly approaching I decided to take risk and make something with them. I called my father-in-law (he had the tools and guidance), went to home depot for the supplies, and walmart for RIT dye and wood stain. I gathered all the supplies and headed on down to my Father-in-law's house where he showed me how to use all of the tools. I used 70 home run balls in all and I have to say I am very pleased how it turned out! When our anniversary finally arrived Chad was very excited, he said it was the best present he had ever received. 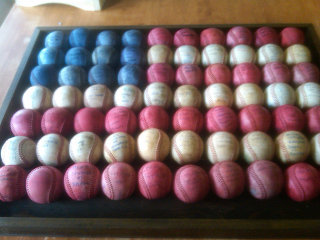 Home run baseballs and a flag- it really doesn't get more American than that!